The event in Kampung Tambatuon, Kota Belud, was more of digging out issues within issues, and searching for solutions, rather than a celebration. The issue is not something new. For years, it has been about the same thing – Native Customary Rights Land. Located along Sungai Kadamaian, Kampung Tambatuon has seen at least eight generations of inhabitants living there. 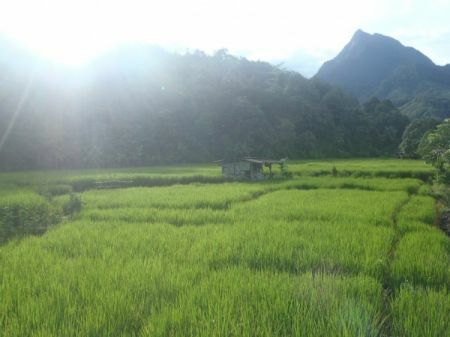 From the field, you can see the majestic Mount Kinabalu. Standing on the bank of the river and looking across, you can see paddy fields neatly arranged. Besides planting paddy, the village also has a homestead that helps generate income. There are plans to construct a dam which will not only drown the entire village, but also affect other villages located along Sungai Kadamaian. The purpose of constructing the dam was said to be either to counter water shortage in Kota Belud, or to turn the place into a tourist attraction. Needless to say, this plan has faced resistance from the villagers. I have always thought that as long as the indigenous community is persistent enough to stay put, no one can force them away from their land. Sitting though forums and discussions, I found out that the Sabah Land Ordinance does not work that way. Should the need arise for a plot of land to be developed for public purposes (i.e. to build a hospital); the community would have to leave. Of course, there are supposed to be compensations. But how is money the same as a home? I also found out that the Communal Grant, is nothing like the name suggest. Among the many terms and conditions, the one which I find most appalling – the government can at any time take the land back. Taking their land may be justified legally, if done for the right reasons. I find it morally wrong in this case. There are eight other alternative locations to construct the dam, which will have lesser impact on the communities and environment. Instead of taking that into consideration, the villagers were offered to embark on a study tour to Kedah by their MP. To see for themselves the lives of communities relocated due to construction of Beris Dam, a move to convince them to give up their ancestral land. Listening to the villagers expressing their concerns during one of the sessions, I can feel their pain and their fear. They feel betrayed knowing that the very person they voted to represent them is standing against them. They feel hopeless when their leader who objected the dam was terminated from his position. Advice poured in from those who have been through and those who are going through similar situations. I left Kampung Tambatuon knowing that the villagers are determined to keep what was passed down by their ancestors. I hope the rights of Orang Asal to live on their land will be acknowledged and respected. If anyone wants to build anything in Kampung Tambatuon, the villagers would like a Rumah Budaya. One who is determined not to rush through life, nor live it like a robot. Unafraid to make mistakes. Undaunted to admit her shortcomings. She finds peace in volunteering and is willing to go through hell to witness the most beautiful sunrise, sunset, and blanket of stars on this earth. She feels comfortable asking for directions in broken Spanish on the streets of Barcelona, as she is dancing the Sumazau and drinking tapai in the villages in north Borneo. Posted on 21 October 2011. You can follow any responses to this entry through the RSS 2.0. Read more articles posted by Shu Woan Teoh. Well said! Keep up the updates here for the readers who may never step their foot on these lands which are equally Malaysian!